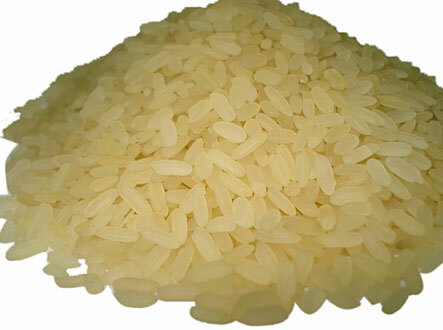 Parboiled rice (also called converted rice) is rice that has been partially boiled in the husk. The three basic steps of parboiling are soaking, steaming and drying. These steps also make rice easier to process by hand, boost its nutritional profile and change its texture. About 50% of the world’s paddy production is parboiled. The treatment is practiced in many parts of the world such as India, Bangladesh, Pakistan, Myanmar, Malaysia, Nepal, Sri Lanka, Guinea, South Africa, Italy, Spain, Nigeria, Thailand, Switzerland, USA and France. Rice is easier to polish by hand (removal of the bran layer) after parboiling but mechanical processing is harder since the bran becomes somewhat oily and tends to clog machinery. Most parboiled rice is milled in the same way as white rice. Parboiling drives nutrients, especially thiamin, from the bran to endosperm, hence parboiled white rice is 80% nutritionally similar to brown rice. Because of this parboiling was adopted by North American rice growers in the early 20th century. You can make delicious khichdi with parboiled rice. Parboiled rice, lentils, spices and seasonings are thrown into a pot or pressure cooker and cooked until the ingredients are cooked and blend well together. This makes very tasty, easy and satiating khichdi that can simply be served with papad and cucumber raita. In south India, this is called ven pongal and is generally served with coconut chutney and sambhar.